Rudhramadevi (Telugu: రుద్రమదేవి) is a 2015 Indian Telugu 3D epic historical fiction film based on the life of Rudrama Devi, one of the prominent rulers of the Kakatiya dynasty in the Deccan, and one of the few ruling queens in Indian history. 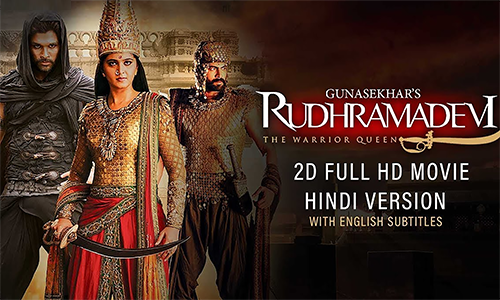 The film written and directed by Gunasekhar features Anushka Shetty as Rudrama Devi, alongside an ensemble cast of Allu Arjun, Rana Daggubati, Vikramjeet Virk, Krishnam Raju, Prakash Raj, Suman, Nithya Menen, Baba Sehgal and Catherine Tresa. The film is narrated by Chiranjeevi. The film's soundtrack and background score were composed by Ilaiyaraaja. Rudhramadevi was released worldwide on 9 October 2015, with dubbed versions in Hindi and Malayalam languages. The Tamil version was released by Sri Thenandal Films on 16 October. The film became the fifth highest opening day grossing Indian film of 2015. It grossed ₹32 crores worldwide in the opening weekend.